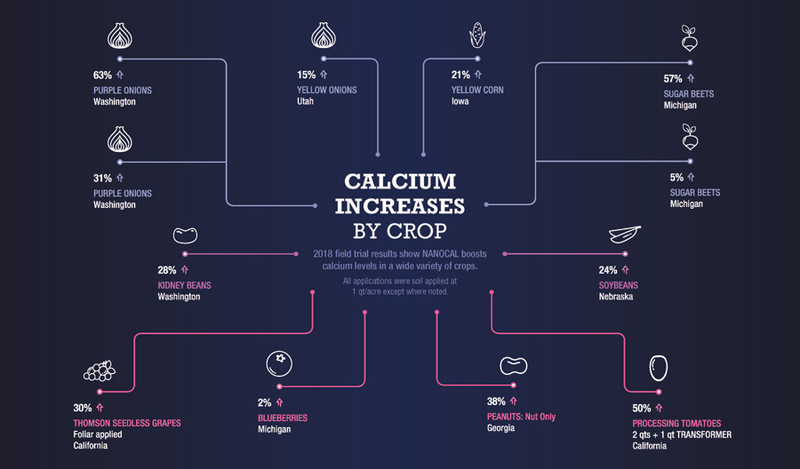 A crop’s demand for available calcium spikes to a high level at the onset of fruit, tuber, nut or bulb formation. A calcium deficiency at this point in development results in dividing cells being unable to stay bound together. This causes problems like hollow heart in potatoes, blossom end rot in tomatoes, and poor storability. ENCOURAGE® NANOCAL® is a readily available, soil-applied calcium supplement that dramatically improves fruit and tuber quality. 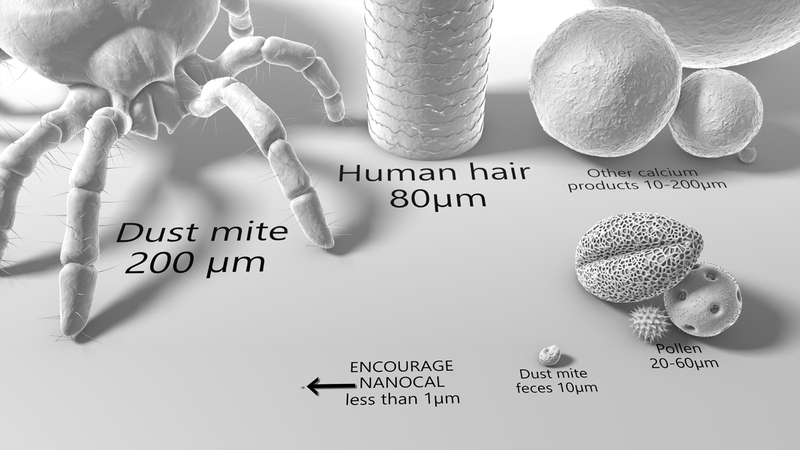 Unlike typical calcium additives with particle sizes up to 80 microns, NANOCAL is milled to less than one micron. 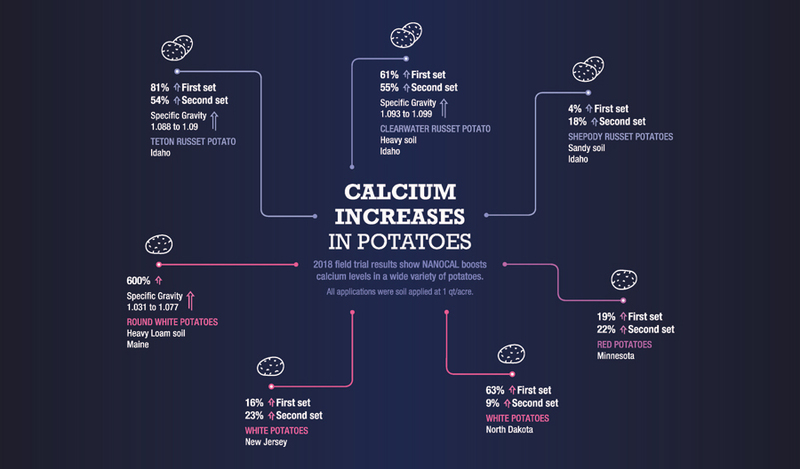 The one-micron-sized calcium found in NANOCAL provides roots a denser field of calcium particle for uptake. Unlike other calcium additives that are far too big to be readily absorbed, NANOCAL’s unique nano-sized calcium carbonate allows the immediate movement into the meristematic region of growing roots for superior fruit and tuber development. NANOCAL’s 1-micron size is small enough to be immediately taken up by plants. Foliar-applied calcium will not translocate to roots. The movement of calcium is primarily through a plant’s transpiration system. For the plant to grow, a steady supply of calcium and water must be supplied by the root system. NANOCAL prevents calcium deficiency by delivering a high concentration of soluble calcium in the soil immediately surrounding the plant’s root system. Soil-applied NANOCAL calcium particles are immediately available to developing tubers or fruit. Soil flocculation for improved growing conditions. An additional benefit of NANOCAL is soil structure improvement. 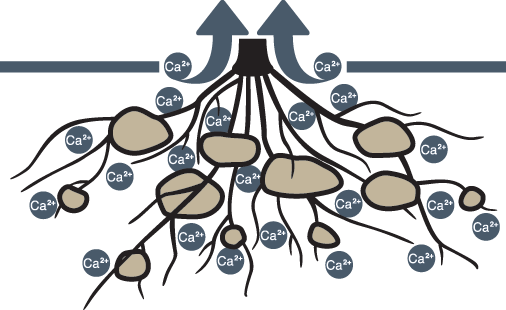 After disassociation from the calcium carbonate molecule in the soil, the positively charged calcium ions bond to the negatively charged clay particles, which opens up pore space for better water and oxygen penetration and reduced resistance to root growth. The only calcium supplement with TransXylem™ technology. The proprietary TransXylem™ technology in NANOCAL facilitates easy movement of material upward from the roots to the fruits and other parts of the plant. This translocation up the xylem ensures calcium is delivered in the most effective way to benefit the entire plant. ENCOURAGE NANOCAL is a source of sub-micronized calcium to be applied at the initiation of fruit set to increase fruit and tuber uptake during cellular division, improve fruit and tuber formation, strengthen cell walls, reduce crop deterioration during storage and promote overall crop vigor. ENCOURAGE NANOCAL should be applied just prior to or at the early stages of fruit or tuber initiation to ensure maximum calcium uptake during cellular division. It is not meant to remedy a calcium deficiency in soil. The calcium particles are milled to an average size of less than 1 micron to be easily transportable within the plant. • ENCOURAGE NANOCAL can be tank mixed with other nutrient, plant growth regulator or crop protection products. • ENCOURAGE NANOCAL can be applied by ground or aerial equipment or chemigated by drop, pivot or sprinkler irrigation. • ENCOURAGE NANOCAL can be tank mixed with most pesticides and nutrients. Prior to use, read all the directions on this product label and the directions on the labels of any tank mix partners being used with ENCOURAGE NANOCAL . USE RATES: Apply 1-8 pints of ENCOURAGE NANOCAL per acre either as a soil or foliar treatment. TIMING: In general, apply ENCOURAGE NANOCAL just prior to fruit or tuber initiation to ensure availability during fruit and tuber cellular division. Below are application timing guidelines for popular crop categories. If you have questions about a specific crop please contact your Oro Agri area manager or local Oro Agri retailer. Fill the tank to the final water volume and continue agitation during application. Applicator should spray and evaluate response for 48 hours prior to widespread usage. May cause staining on handler’s apparel and hard surfaces. Application of certain nutrients during high temperatures may result in staining or cosmetic injury of fruit or rind. Test all new tank mixes before widespread use. Do not apply directly to seed. To ensure thorough mixing, it is suggested that you recirculate mini tanks and bulk tanks or shake containers before using. Do not mix ENCOURAGE NANOCAL with undiluted tank mix partners until you have conducted a jar test in a separate container using the proportionate amount of ENCOURAGE NANOCAL to make sure the products are compatible. Agitate and let stand 10 minutes. Settling that does not disperse indicates an incompatible mixture. Do not use on crops or plants that are sensitive to surfactants. Do not mix with or add other surfactants. STORAGE: Keep away from open flames, hot surfaces and sources of ignition. Store in a cool, dry, well-ventilated place out of direct sunlight. Store in original tightly closed container away from children, animals, foods, feeds and seeds. PRODUCT AND CONTAINER DISPOSAL: Do not allow this material to drain into sewers/water supplies. Empty containers or liners may retain some product residues. Triple rinse (or equivalent) during mixing and loading. Dispose of contents in accordance with local/regional/national/international regulations.